So my friend Ally and I are giving podcasting a whirl. 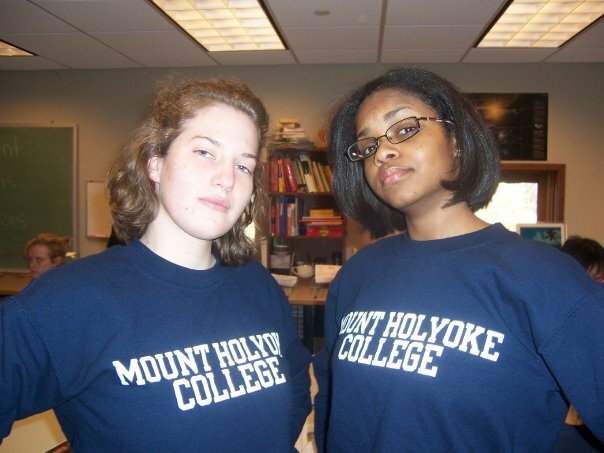 Back in the day, Ally and I were editors on the Mount Holyoke News together. One time Ally and I wore the same sweater to a Mount Holyoke News meeting. This is the only photographic evidence that we are friends. After graduating from Moho, Ally received an MA in journalism from NYU and she blogs about teen dramas on The Remote Generation. We see each other fairly frequently in NYC and go to the movies together/tweet at each other/hurl insults at each other on Facebook. We have a modern friendship. And now we are podcasting together because we both love our pop culture a little bit too much and are kind of bored with our daily lives. I also wanted an excuse to use Tumblr daily. Teaming up and podcasting seems like a great outlet. And I get to play with the editing programs I learned to use with my college degree on a weekly basis. So it is also resume building. Anyways, here it is the first podcast. Listen up and enjoy! You can also listen to/download the episode on Podomatic and follow our pop culture adventures on Twitter/Tumblr. Next Next post: Happy 100th Birthday, Lucy!